Comfort is crutial to obtaining maximum productivity, so increase your productivity levels today with the RPB® Nova 1™. The mandatory high standards of a modern workplace make health and safety a top priority. Aside from risk to valued employees, there are potential costs of business disruption, non-compliance and the knock-on effect of your company's reputation that all need to be considered. Meeting worldwide respiratory protection stadards including CE and AS/NZS, the Nova 1 minimises the risk to your employees and your business. 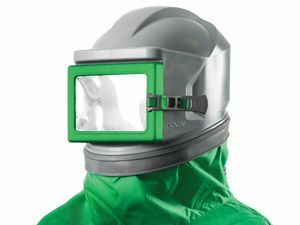 Designed with the same features of the Nova 2000™ that improve operator comfort and boost employees' performance, the only difference of the Nova 1™ is that it has a large flat rectangular visor which can incorporate both glass and tear-off lenses. Consisting of three main components, the helmet assembly, breathing tube and air supply. All three components must be present and properly assembled to constitute a complete EN14594 and AS/NZS 1716 approved Compressed Airline Breathing Apparatus.